General Motors rolled out a long-term game plan for autonomous cars Thursday morning to investors, and the big takeaway so far is that it thinks it can launch a fully-autonomous ride-sharing service by 2019 in “multiple cities.” That’d put it well-ahead of competitors and their own timelines. Only general details in GM’s presentation are available for now, but the automaker’s president, Dan Ammann, said the company’s primed to launch an autonomous fleet at scale within the next couple of years. Few details were available about the ride-sharing service that’s planned. GM’s self-driving car unit, Cruise Automation, launched a pilot app in August that allows employees in San Francisco to take test rides in the company’s autonomous cars for free. But GM has a significant investment in ride-hailing company Lyft and also maintains a ride-sharing platform of its own, Maven. A GM spokesperson didn’t immediately respond to a request for comment. GM employees currently sit at the wheel during tests, but the goal is to deploy fully-driverless cars at the time of launch, Ammann said. “We need to take the driver out of the car in order to make the impact we want to make,” Ammann said Thursday. The company alluded to San Francisco being the most likely target for launching the service, but the presentation doesn’t specify what cities GM will initially target. The company currently tests autonomous cars in San Francisco, Phoenix and the Detroit area. 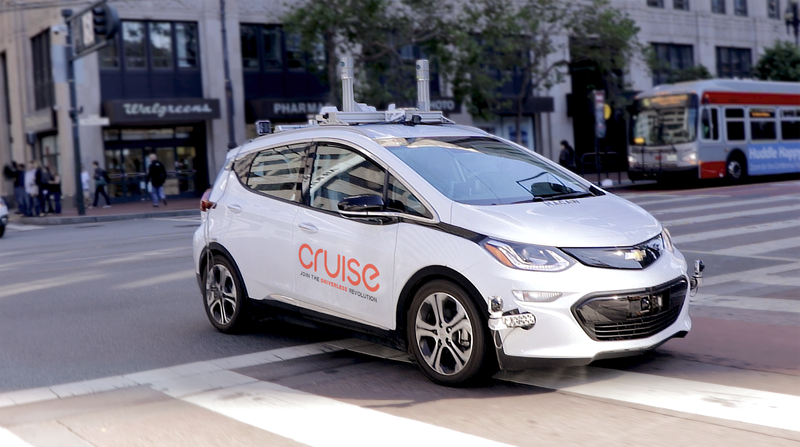 Cruise is expected to be the first company to test autonomous cars in Manhattan sometime early next year. Ammann also laid out a business case for autonomous cars, saying the cost for proprietary sensors that can make the car drive itself should eventually be as low as $300. In part, that’s due to the recent acquisition of Strobe, a company that makes LIDAR, a crucial laser-based radar that allows a car to see its environment. GM and Cruise are currently building autonomous Chevy Bolts at an assembly plant in Michigan, which Ammann says we’ll help the companies better understand how to manufacture self-driving cars. GM said that 180 self-driving Bolts have been built so far, and by early 2018, its autonomous fleet will be accumulating 1 million miles per month during test drives. Google’s self-driving unit, Waymo, recently deployed a driverless pilot program in Phoenix, but GM’s announcement puts it well ahead of competitors who’ve expressed interest in launching commercial autonomous fleets for ride-sharing purposes. Ford, for instance, says it should have an autonomous car on the road by 2021 for ride-hailing purposes. Uber recently announced a purchase of 24,000 autonomous Volvos, but first deliveries aren’t expected until 2019. Autonomous car regulations also remain vague and could throw a wrench in GM’s plans, if the federal government seeks more oversight of how fully-driverless cars will be deployed. It’s almost certain the initial deployment of autonomous cars—in small, confined urban environments like GM has in mind—will be the extent of the public’s experience with the technology for some time to come. But GM now thinks its can get there by 2019, which will only ratchet up the pressure on competitors. Perhaps that’s why Ammann struck a note of confidence on Thursday, when he said that autonomous cars represent the biggest business opportunity since the creation of the internet. Now GM has to prove it can deliver.